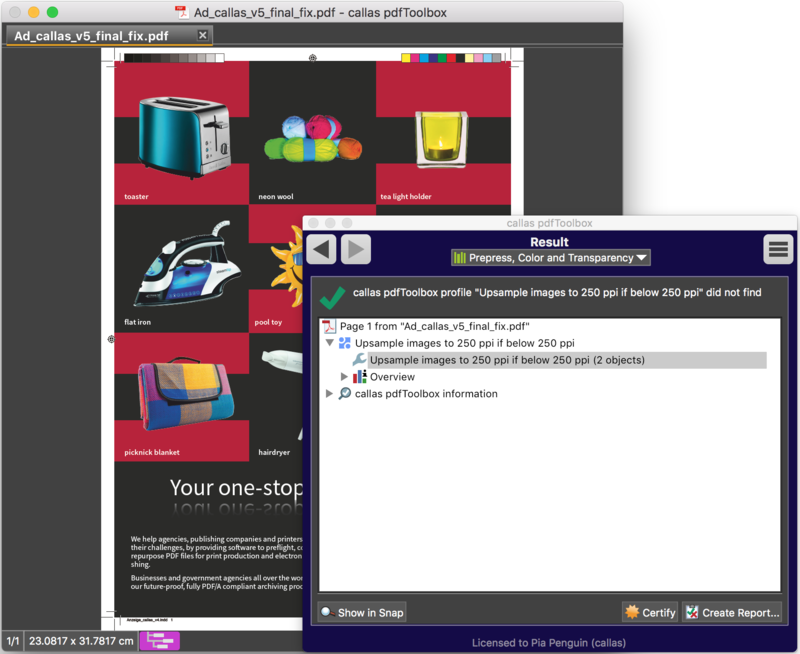 Sometimes it is required by a printer that the resolution of all images in a PDF have at least a certain amount. This can become difficult, especially if the low-res images are not available in a higher resolution. 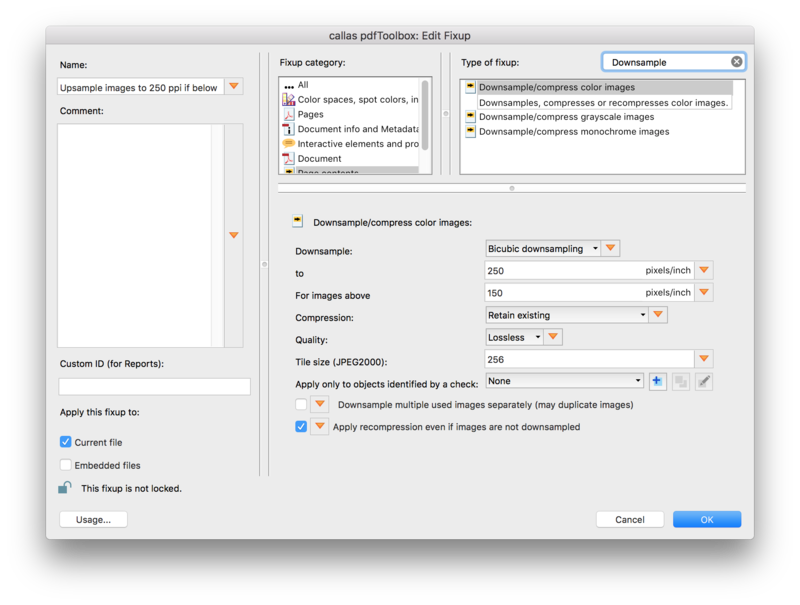 The pdfToolbox Fixups "Downsample/compress ... images" (available for color, grayscale and bitmap images) can also upsample images, which means that it can increase the resolution (e.g. from 200 to 250 ppi). Since the amount of input data is limited, visual quality cannot be improved of course. But the images will then match the appropriate resolution guidelines. In this sample PDF, 2 images have a resolution below 250 ppi. To set up a Fixup, go to the Fixup-dialog (Menu: Tools - Fixups or CMD/CTRL + 5) and select "Create Fixup" in the options menu in the upper right. Then search for "Downsample". First, the target resolution in the area under "to:" in the edit dialog has to be defined. 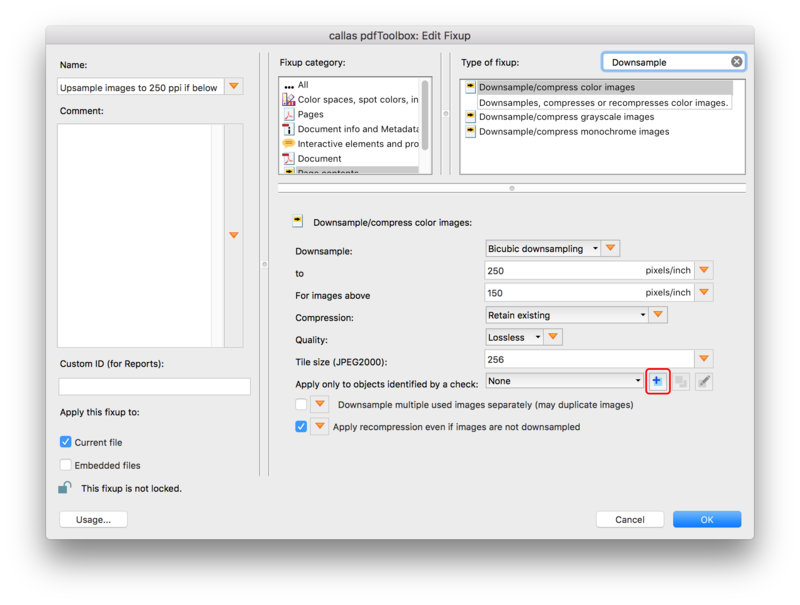 As it does not make much sense to up-sample images with a very bad resolution, images below a certain threshold should be excluded from upsampling ("For images above"). It is important to activate the "Apply recompression even if images are not downsampled" option. But if you would run this Fixup, images with 250 ppi or more would become downsampled as well - so how to exclude them from processing? 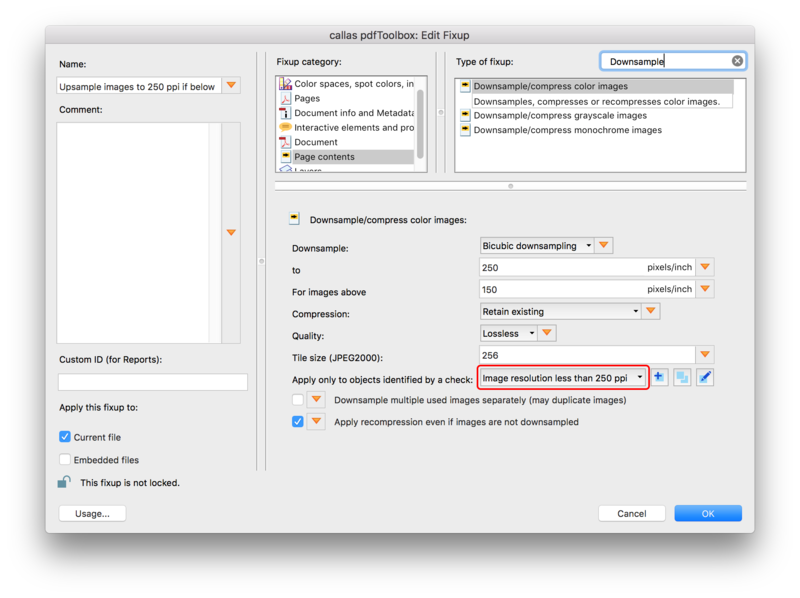 To exclude images, which already have the sufficient resolution, the Fixup must be limited to those images having less than e.g. 250 ppi. Click on the "Create new Check" icon behind the pop-up-menu of "Apply only to objects identified by a check". This dialog will create a new check. 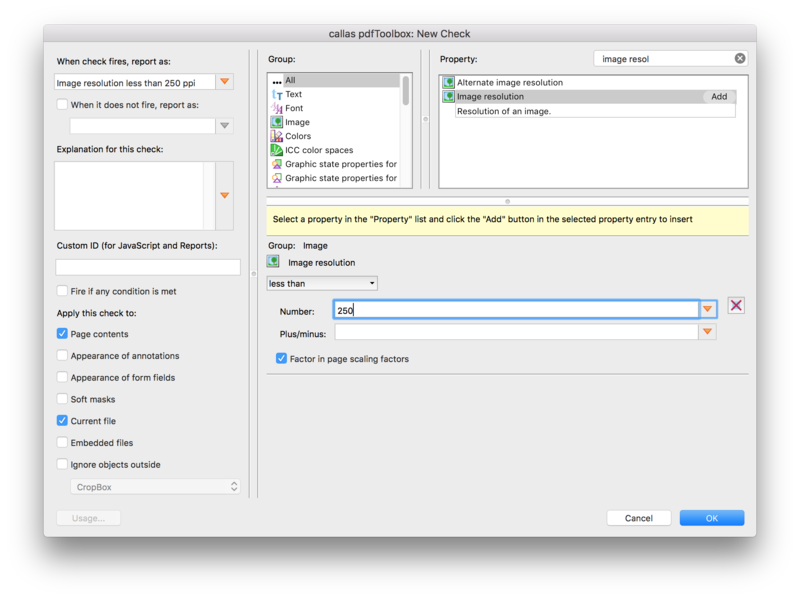 Search for "Image resolution" in the upper right corner and select the one shown on the image above and click "Add"
The new Check will automatically be preselected in the "Apply to" drop-down. Save the Fixup with a click on the "OK" button. When this Fixup will be executed, the low-res images (in this case below 250 ppi) will be upsampled (to 250 ppi).